The recently concluded ninth World Urban Forum (WUF9) provided a platform for grassroots voices to be heard. Ideas and transformative solutions were the order of the day, as participants shared and discused ideas and solutions being used in their respective countries. 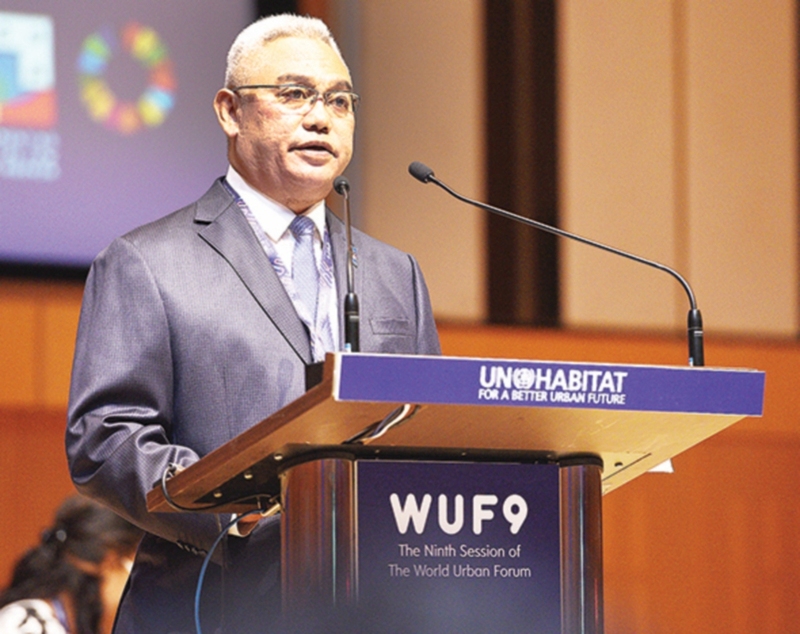 Urban Wellbeing, Housing and Local Government Minister Tan Sri Noh Omar observed that more than 50 per cent of the world’s population now lives in urban areas, and stated that cities must be reformed to be safe, inclusive, sustainable and prosperous. He noted that WUF was hosting a Grassroots Assembly for the first time, aiming to give a platform to local leaders. WUF9 brought together thousands of stakeholders to share practices and knowledge on how cities are built, planned and managed, and to discuss and present commitments, strategies, and innovations, identify institutional roles, as well as pursue partnerships, in the implementation of the New Urban Agenda (NUA). “The Malaysian Government has introduced the Public Housing Programme (PPR) to address the housing needs of those in the B40 category. These PPR units are normally rented out at RM124 (USD30) per month to families with monthly income of less than RM3,000 (USD750). “As of January 2018, 75,405 households have benefited from this programme. To assist the poor who are unable to secure loans or financial assistance from the private banking institution, we have the Rent to Own Scheme. Urban Wellbeing, Housing and Local Government Minister Tan Sri Noh Omar addressing the opening assemblies. “The PPR houses are sold at a subsidised rate. For example, one unit of PPR in the Peninsular is sold at RM35,000 (USD9,000) while the building cost is about RM180,000 (USD46,000). The RTO scheme initiative allows the targeted group to rent and own the unit after 25 years,” he said. During the Women Assembly, UN-Habitat executive director Datuk Maimunah Mohd Sharif highlighted Penang’s introduction of gender-responsive and participatory budgeting during her term as mayor. She stressed the need for acquiring data on women’s unique challenges, such as their safety on public transport. At the Business Assembly, World Bank Global Director, Urban & Territorial Development Sameh Wahba noted the adoption of the 2030 Agenda and the NUA has provided a fresh impetus to strengthen partnerships with business towards enhanced, transformative investments in urban development. Danielle Grossenbacher, International Real Estate Federation, called for creative solutions to increase the affordability of land, and to improve building techniques and materials and requested that participants share smart affordable housing examples from around the globe. Melaka Chief Minister and World Assembly of Youth president Datuk Seri Idris Haron addressed the Children and Youth assembly through a video message and called for the inclusion of youth in urban development. UN-Habitat deputy executive director Aisa Kirabo Kacyira urged youth to transform passion into action.She recommended strategic planning and monitoring, and cautioned that such efforts should not become disconnected from the grassroots level. She concluded by encouraging youth to take leadership roles, and to hold other leaders accountable. At the World Assembly of local and regional governments, Commonwealth Local Government Forum secretary general Greg Munro called for global leaders to place their trust in local and regional governments, and allow local residents to be engaged at the core of decision making. Meanwhile, at the Grassroots Assembly, Cities Alliance senior urban specialist Rene Hohmann emphasised that grassroots organisations act as agents of change. High-level roundtables were also held to discuss proposals for national and local governments to reposition housing at the centre of planned urbanisation by operating a paradigm shift in the way we approach housing issues: from a building-only perspective to a more comprehensive view of housing as more than a roof and four walls. “Housing is a basic necessity for individuals and an important component when discussing about human habitat. Under UN-Habitat’s definition, housing is not limited to just shelter for individuals. A proper house should provide shelter from the elements of nature, offer security, adequate privacy and space with proper transportation facilities and access to adequate basic amenities. “For me, it is very important that all governments meet the housing needs of the people because by owning a house, they will have a sense of belonging and ownership. Quality housing contributes to well-being and quality of life, said Urban Wellbeing, Housing and Local Government deputy minister Datuk Halimah Mohamed Sadique. ‘Cities for all with housing at the Centre’, was moderated by Greg Budworth from Compass Housing Services, Australia. On addressing inequality in cities, Khazanah Nasional chief executive officer Azman Mokhtar stressed that “prevention is better than cure,” and highlighted that basic infrastructure and accessible markets are key. India and Mali shared their country experiences of providing ‘social housing’, with India highlighting the role of civil society in ensuring a collaborative approach towards providing all Indians with a home by 2022, and Mali mentioning its tax breaks to developers, which has had the secondary benefit of establishing industrial areas. José Carrera from the Development Bank of Latin America, highlighted the potential to address social exclusion through housing initiatives. He argued that questions of productivity are important for cities, which, he said, do not only provide goods and services but also create opportunities for investment, employment and growth. There were concurrent sessions and working groups during the Children and Youth Assembly. Delegates highlighted their respective national initiatives, including: an energy-welfare partnership in Seoul that has created jobs in retrofitting homes for energy efficiency; action by Ugandan slum dwellers to gather data on slums for planning purposes; and Thailand’s “cities without slums” housing development strategy that is working with civil society partners. ‘Urban Dimension of Climate Change Action’ was moderated by William Cobbett from Cities Alliance. He said cities will be key to implementing the global agendas of sustainable development, climate action and the New Urban Agenda (NUA). In a keynote address, Energy, Green Technology and Water Minister secretary general Zaini Ujang, presented Malaysia’s Green Technology Master Plan that identifies 16 sectors as areas with high potential to transition the economy towards sustainability. Public Service Department (PSD) director-general Tan Sri Zainal Rahim Seman, during the dialogue on Transformative Partnerships in Urban Management, said local governments must establish transformative partnerships to face the emerging challenges in urban management and shared some of Malaysia’s experience in this area. He spoke on Medini City, a strategic alliance between Iskandar Puteri City Council and Medini Incorporated Malaysia Sdn Bhd in planning, development, implementation and maintainance of a new futuristic city in Johor. This partnership has increased the capacity of the local government to manage and sustain the city as a distinctive, vibrant, connected, sustainable, beautiful and a people’s city. Another example is the redevelopment of Kampung Kerinchi’s housing by the Kuala Lumpur City Hall, in collaboration with a private developer, UOA Development Berhad, which has transformed an old low-cost housing into a modern high rise prime housing with commercial buildings. At the national level, Malaysia adopted the National Blue Ocean Shift (NBOS), a unique and dynamic national strategy platform which brings together ministries, agencies, all levels of governments and the private sector to achieve high impact, low cost and rapid execution initiatives. One such successful NBOS project is the Urban Transformation Centre (UTC), which has been replicated in 14 urban areas and has resulted in the federal government and the local governments working side by side under one roof.